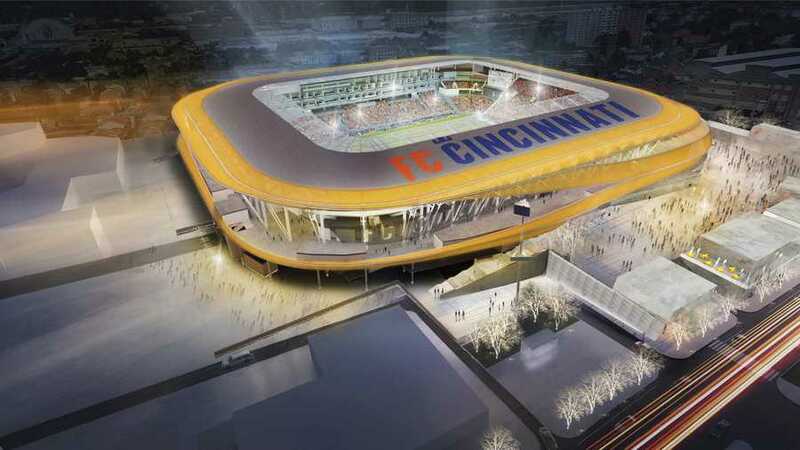 Major League Soccer (MLS) club FC Cincinnati has revised the design of its new stadium, with Populous replacing Meis as its architectural partner for the project. The new design includes two key changes from the previous masterplan. The Cincinnati Enquirer newspaper said the stadium will now have a canopy extending over every seat, meaning it will have a full bowl rather than open ends. One of the most eye-catching elements of the original design has also been revised. FC Cincinnati is planning extensive use of ethylene tetrafluoroethylene (ETFE), a translucent material that, through LED lighting, can make the building glow and change colour. The stadium was originally intended to be completely wrapped in EFTE, but this has now been scaled back to ribbons on the exterior of the building. There have been concerns over how the stadium will emit light and sound in the local neighbourhood. The Enquirer said the new plans have been revealed through a light and sound study conducted by the team and submitted to the City of Cincinnati ahead of a planning commission meeting scheduled for May 10, when the franchise will seek final approval of the development plan. FC Cincinnati president and general manager, Jeff Berding, said: “Stadiums – specifically MLS’ soccer-specific stadiums – are becoming showpieces in the sports world and true attractions in the home markets. Cincinnati was announced as the latest location for an MLS team in May 2018, bringing the total number of franchises to 24 from the current 2019 season. FC Cincinnati held a ground breaking ceremony for its new 26,000-seat stadium in December, however this was conducted with a number of hurdles still to clear before work can commence in earnest this year. The team made its MLS debut last month and is currently playing at Nippert Stadium, where it will remain before moving into the privately-funded $250m (£191.2m/€222.7m) stadium in March 2021. The Enquirer added that while Meis has created the latest renderings, Populous will take over from this point onwards.